Henry V of England (September 16, 1387 – August 31, 1422) was one of the great warrior kings of the Middle Ages. He was born at Monmouth, Wales, September 16, 1387, and he reigned as King of England from 1413 to 1422. Henry was son of Henry of Bolingbroke, later Henry IV, and Mary de Bohun, who died before Bolingbroke became king. At the time of his birth during the reign of Richard II, Henry was fairly far removed from the throne. During his life he tried to make amends for the usurpation of the throne by his father; reconcile the Welsh who had suffered under his father's policies; heal the Papal Schism and unite the country through upholding justice. By the time Henry died, he had not only consolidated power as the King of England but had also effectively accomplished what generations of his ancestors had failed to achieve through decades of war: unification of the crowns of England and France in a single person. In 1398 when Henry was twelve his father, Henry Bolingbroke, was exiled by King Richard II, who took the boy into his own charge, treated him kindly and took him on a visit to Ireland. In 1399, the exiled Bolingbroke, heir to the Dukedom of Lancaster, returned to reclaim his lands. He raised an army and marched to meet the King. Richard hurried back from Ireland to deal with him. They met in Wales to discuss the restitution of Bolingbroke's lands. Whatever was intended, the meeting ended with Richard being arrested, deposed, and imprisoned. He later died in mysterious circumstances. The young Henry was recalled from Ireland into prominence as heir to the Kingdom of England. He was created Prince of Wales on the day of his father's coronation as Henry IV. He was also made Duke of Lancaster, the third person to hold the title that year. His other titles were Duke of Cornwall, Earl of Chester, and Duke of Aquitaine in France. The Welsh revolt of Owain Glyndŵr (Owen Glendower) started soon after Henry IV was crowned. Richard II had been popular in Wales as he had created new opportunities for Welsh people to advance. This changed under Henry IV and Owain was one of the people who was unfairly treated by the new King. So in 1400 Owain was proclaimed Prince of Wales. His campaign was very popular and soon much of Wales was in revolt. Owain had a vision of an independent Wales with its own parliament, church and universities. In response Henry IV invaded Wales but without success. So Henry appointed the legendary warrior Harry Hotspur to bring order to Wales. Hotspur favored negotiation with Glyndŵr and argued that it was Henry's merciless policies that were encouraging the revolt. When the situation worsened Hotspur defected to Glyndŵr's camp and challenged the young Henry's right to inherit the throne. Henry met Hotspur at the Battle of Shrewsbury in 1403 and defeated him. Henry continued to fight the Welsh and introduced new tactics using economic blockades. However, after his father Henry IV died in 1413, Henry began to adopt a conciliatory attitude to the Welsh. Pardons were offered to the major leaders of the revolt. In 1415 Henry V offered a pardon to Owain and there is evidence that the new King Henry was in negotiations with Owain's son, Maredudd, but nothing was to come of it. In 1416 Maredudd was offered a pardon but refused. Perhaps his father was still alive and he was unwilling to accept the pardon while he lived. He finally accepted a pardon in 1421, suggesting that Owain was dead. As King Henry IV's health declined, Henry began to take a wider role in politics. From January 1410, helped by his uncles Henry and Thomas Beaufort, he had practical control of the government. However, in both foreign and domestic policy he differed from the King who discharged the Prince from the council in November 1411. The quarrel of father and son was political only, though it is probable that the Beauforts had discussed the abdication of Henry IV, and their opponents certainly endeavored to defame the prince. It may be to that political enmity that the tradition of Henry's riotous youth, immortalized by Shakespeare, is partly due. Henry's record of involvement in war and politics, even in his youth, disproves this tradition. The story of Falstaff originated partly in Henry's early friendship with Sir John Oldcastle. That friendship, and the prince's political opposition to Thomas Arundel, Archbishop of Canterbury, perhaps encouraged Lollard hopes. If so, their disappointment may account for the statements of ecclesiastical writers, like Thomas Walsingham, that Henry on becoming king was changed suddenly into a new man. After his father Henry IV died on March 20, 1413, Henry V succeeded him and was crowned on April 9, 1413. With no past to embarrass him, and with no dangerous rivals, his practical experience had full scope. He had to deal with three main problems: the restoration of domestic peace, the healing of the Papal Schism in the Catholic Church, and the recovery of English prestige in Europe. Henry grasped them all together, and gradually built upon them a yet wider policy. From the outset, he made it clear that he would rule England as the head of a united nation, and that past differences were to be forgotten. As an act of penance for the usurpation of the throne by his father, Henry had the late king, Richard II, honorably reinterred in Westminster Abbey. The young Edmund Mortimer, 5th Earl of March, whose father had supported Owain Glyndŵr, was taken into favor. The heirs of those who had suffered in the last reign were restored gradually to their titles and estates. The gravest domestic danger was Lollard discontent. But the king's firmness nipped the movement in the bud (January 1414), and made his own position as ruler secure. With the exception of the Southampton Plot in favor of Mortimer, involving Henry Scrope, 3rd Baron Scrope of Masham and Richard, Earl of Cambridge (grandfather of the future King Edward IV of England) in July 1415, the rest of his reign was free from serious trouble at home. Henry could now turn his attention to foreign affairs. He revived the dynastic claim to the French throne and demanded a return of feudal land that previously belonged to the English crown. Old commercial disputes and the support which the French had lent to Owain Glyndŵr were also used as excuses for war, whilst the disordered state of France afforded no security for peace. Furthermore the French king, Charles VI, was prone to mental illness, and his eldest son, the Dauphin, an unpromising prospect. Henry V invaded France for several reasons. He hoped that by fighting a popular foreign war, he would strengthen his position at home. He wanted to improve his finances by gaining revenue-producing lands. He also wanted to take nobles prisoner either for ransom or to extort money from the French king in exchange for their return. Evidence also suggests that several lords in the region of Normandy promised Henry their lands when they died, but the King of France confiscated their lands instead. Henry's army landed in northern France on August 13, 1415, and besieged the port of Harfleur with an army of about twelve thousand. The siege took longer than expected. The town surrendered on September 22, and the English army did not leave until October 8. The campaign season was coming to an end, and the English army had suffered many casualties through disease. Henry decided to move most of his army (roughly seven thousand) to the port of Calais, the only English stronghold in northern France, where they could re-equip over the winter. During the siege, the French had been able to call up a large feudal army which the Constable of France, Charles d'Albret, deployed between Harfleur and Calais, mirroring the English maneuvers along the River Somme, thus preventing them from reaching Calais without a major confrontation. 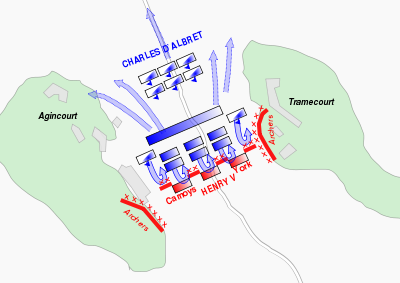 The result was that d'Albret managed to force Henry into fighting a battle that, given the state of his army, Henry would have preferred to avoid. The English had very little food, had marched 260 miles in two and a half weeks, were suffering from dysentery, and faced large numbers of experienced, well equipped Frenchmen. Although the lack of reliable and consistent sources makes it very difficult to accurately estimate the numbers on both sides, estimates vary from 6,000 to 9,000 for the English, and from about 15,000 to about 36,000 for the French. The battle was fought in the narrow strip of open land formed between the woods of Tramecourt and Agincourt. Henry deployed his army (approximately nine hundred men-at-arms and five thousand longbowmen) across a 750 yard part of the defile. It is likely that the English adopted their usual battle line of longbowmen on either flank, men-at-arms and knights in the center, and at the very center roughly two hundred archers. The English men-at-arms in plate and mail were placed shoulder to shoulder four deep. The English archers on the flanks drove pointed wooden stakes called palings into the ground at an angle to force cavalry to veer off. The French advanced but in such large numbers that they became congested and could not use their weapons properly. At the same time the English archers rained arrows onto them. As the battle was fought on a ploughed field, and there had recently been heavy rain leaving it very muddy, it proved very tiring for the French to walk through in full plate armor. The deep, soft mud favored the English force because, once knocked to the ground, the heavily armored French knights struggled to get back up to fight in the melee. The lightly armored English archers and soldiers were able to attack them easily. The only French success was a sally behind the lines towards the end of the battle. Six hundred French horsemen who had fled the battle seized the King's baggage and killed any servants that resisted. Thinking his rear was under attack and worried that the prisoners would rearm themselves with the weapons strewn upon the field, Henry ordered their slaughter. Many of the nobles and senior officers, wishing to ransom the captives (and from a sense of honor, having received the surrender of the prisoners), refused. The task fell to the common soldiers. When Henry realized what was going on he called a halt to the killing. It is believed more Frenchmen died in this slaughter than in the battle itself. Henry spent the next two years preparing for the next stage of his campaign. The command of the sea was secured by driving the Genoese allies of the French out of the Channel. Successful diplomacy detached the emperor Sigismund from France, and the Treaty of Canterbury paved the way to end the schism in the Church. So in 1417 the war was renewed on a larger scale. Lower Normandy was quickly conquered; Rouen cut off from Paris and besieged. The French were paralyzed by the disputes of Burgundians and Armagnacs. Henry skillfully played them off one against the other, without relaxing his warlike energy. In January 1419 Rouen fell. By August the English were outside the walls of Paris. The intrigues of the French parties culminated in the assassination of John the Fearless by the Dauphin's partisans at Montereau (September 10, 1419). Philip, the new duke, and the French court threw themselves into Henry's arms. In 1420, Henry met with the mad king Charles VI, who signed the Treaty of Troyes, by which Henry would marry Charles' daughter Catherine of Valois and Henry's heirs would inherit the throne of France. The Dauphin, Charles VII, was declared illegitimate. Henry formally entered Paris later that year and the agreement was ratified by the Estates-General. From June to July his army besieged and took the castle at Montereau, and from that same month to November, he besieged and captured Melun, returning to England shortly thereafter. He was now at the height of his power. His eventual success in France seemed certain. He shared with Sigismund the credit of having ended the Great Schism by obtaining the election of Pope Martin V. All the states of Western Europe were being brought within the web of his diplomacy. The headship of Christendom was in his grasp, and schemes for a new crusade began to take shape. He actually sent an envoy to collect information in the East. On June 10, 1421, Henry sailed back to France for what would be his last military campaign. From July to August, Henry's forces besieged and captured Dreux. That October, his forces lay siege to Meaux, capturing it on May 2, 1422. But then Henry V suddenly died on August 31, 1422, at Bois de Vincennes near Paris, apparently from dysentery which he contracted during the siege of Meaux. He was 34 years old. Before his death, Henry named his brother John, Duke of Bedford regent of France in the name of his son Henry VI, then only a few months old. Henry V did not live to be crowned King of France himself, as he might confidently have expected after the Treaty of Troyes, as ironically the sickly Charles VI, to whom he had been named heir, survived him by two months. Catherine took Henry's body to London and he was buried in Westminster Abbey on November 7, 1422, in a splendid tomb. Following his death, Catherine secretly married or had an affair with a Welsh courtier, Owen Tudor, and they would be the grandparents of King Henry VII of England. Henry's last words were a wish that he might live to rebuild the walls of Jerusalem. They are significant. His ideal was founded consciously on the models of Arthur and Godfrey as national king and leader of Christendom. So he is the typical medieval hero. Yet he was not reactionary. His policy was constructive: firm central government supported by parliament; church reform on conservative lines; commercial development; and the maintenance of national prestige. His aims in some respects anticipated those of his Tudor successors, but he would have accomplished them on medieval lines as a constitutional ruler. His success was due to the power of his personality. He could train able lieutenants, but at his death there was no one who could take his place as leader. War, diplomacy and civil administration were all dependent on his guidance. His dazzling achievements as a general have obscured his more sober qualities as a ruler, and even the sound strategy, with which he aimed to be master of the narrow seas. If he was not the founder of the English navy he was one of the first to realize its true importance. Henry had so high a sense of his own rights that he was merciless to disloyalty. But he was also scrupulous of the rights of others, and it was his eager desire to further the cause of justice that impressed his French contemporaries. He has been charged with cruelty as a religious persecutor; but in fact he had as prince opposed the harsh policy of Archbishop Arundel, and as king sanctioned a more moderate course. Lollard executions during his reign had more often a political than a religious reason. To be just with sternness was in his eyes a duty. So in his warfare, though he kept strict discipline and allowed no wanton violence, he treated severely all who had in his opinion transgressed. In his personal conduct he was chaste, temperate and sincerely pious. He delighted in sport and all manly exercises. At the same time he was cultured, with a taste for literature, art and music. Henry V is the subject of the play Henry V by William Shakespeare, which largely concentrates on his campaigns in France. In the play Henry is presented as the ideal monarch who wrestles with his conscience as he strives to do God's will. Such plays played an important role in the moral formation of English political culture by presenting a model of leadership to be emulated. Henry invites any soldiers who do not wish to fight to go home. Such freely given loyalty remains the basis of English patriotism. Henry himself always led from the front even risking his life to save others. In the play Shakespeare also explored important ideas such as the just war. As always different perspectives are articulated through the various characters. The final marriage scene of Henry and Catherine is an inspiring vision of the purposes and holiness of marriage and of international marriage as a way to bring about peace and reconciliation. Henry is also a main character in Henry IV, Part 1 and Henry IV, Part 2, where Shakespeare dramatizes him as "Prince Hal," a wanton youth who undergoes a change of character on becoming king. Tyler, J. Endell. Henry of Monmouth:Memoirs of Henry the Fifth. Volume 1, Volume 2 at Project Gutenberg. Henry V of England ThoughtCo. 1. Van de Pas, Leo, Genealogics.org (2007). History of "Henry V of England"
This page was last modified on 19 December 2017, at 17:39.